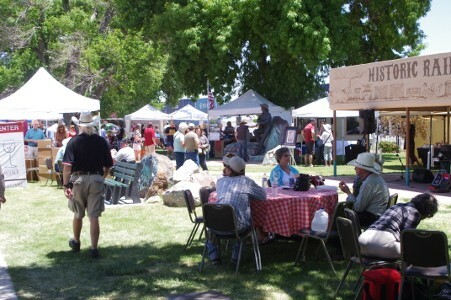 The Willcox Wine Festival was held on May 18th and 19th, 2013 at Railroad Park in downtown Willcox. 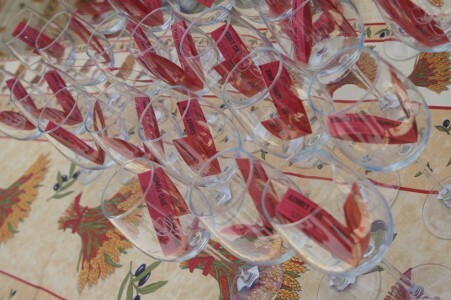 For $15 you received a commemorative glass and eight tickers to allow you to sample wines of your choice. There were 16 wineries represented and they came from different parts of the state. We got to catch up with some of our friends from the wineries and also met some people that may become future guests at Down By The River B and B. The casual atmosphere at the wine festival allows you ample time to have some wine, listen to entertainment and enjoy the outdoors. The venue’s only drawback is that Railroad Park is, you guessed it, next to the Union Pacific main line and trains rumble by tooting their horn at the crossings. Fortunately this isn’t continuous nor does it last long. In addition to the wine tasting there are other local vendors that feature their wares at the Willcox Wine Festival. There were a variety of booths for you to visit and make purchases including, food, chocolate (chocolate goes good with red wine), nuts, art, jewelry to name a few. 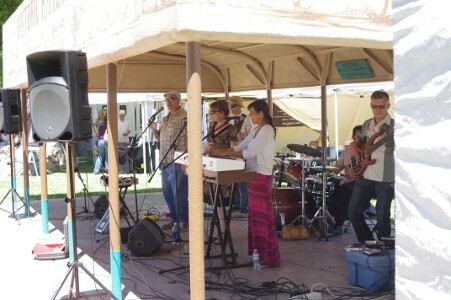 During both days of the festival there was live music by some good bands. So you can have a great day in the park doing different things. Bring a chair like we did. Then you can sit in the shade listen to the music and sip some wine that you can purchased from your favorite vintner. It can’t get much better than this! The Willcox Wine Festival sold tickets and a commemorative wine glass for $15. Angie and I were able to talk with Terry from Coronado and she told us that the new Cab would be bottled, hopefully in June. We were invited to do a barrel tasting of this wine in 2012 and it was excellent even then. It should be fantastic when bottled and be exceptional with a good steak. We also spent some time with Curt and Peggy from Laurence Dunaham Vineyards and with Kief from Kief Joshua. Rhona from Zapara Vineyards was in a booth next to Golden Rule and Coronado so we were able to talk with her a little before moving on to other tasting booths. 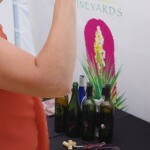 There is always something different at the Willcox Wine Festival and this year was no exception. There were two new wineries represented and we made sure to stop by. We always stop to check out wineries that are new to get an idea of what they have to offer. One vintner was Rolling View / Saeculum Cellars. Dan had some nice wine and we did buy a bottle. The other is Flying Leap Vineyards. Flying Leap bought Canelo Hills in Sonoita from the Muellers. They are carrying the Canelo Hills wines but they do have some of their own. We only had one ticket left and so we didn’t get to sample all their offering. They have a tasting room in Sonoita and they also have just opened one in Willcox on Railroad Ave so we will get to know them a little better on our next trip. We also made a stop by Gallifant Cellars to touch base with Gavin, but he wasn’t there. He had misplaced his credit card slider for his phone and he was out looking for it. We didn’t get back there to find out if he found it. The only other winery from Sonoita, other than Kief Joshua and Flying Leap, was Dos Cabezas WineWorks. We do like their wine but with limited tickets we wanted to sample ones we hadn’t tasted in a while. The Willcox area is where many of the vintners from the Cottonwood have their vineyards. 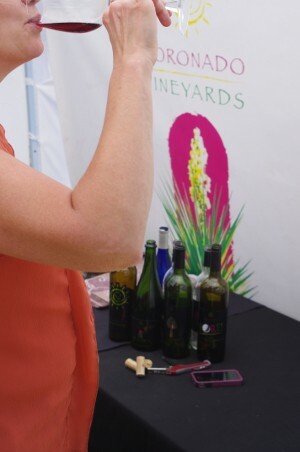 Arizona Stronghold, Pillsbury Wine Company and Page Springs had booths and we don’t get much of a chance to sample their wines unless we head up toward the Flagstaff and Sedona locations. The other Willcox wineries were Carlson Creek (with their great T-Shirt design), Keeling Schaefer and Sand-Reckoner. Kokopelli Winery from Chandler was also at the festival. 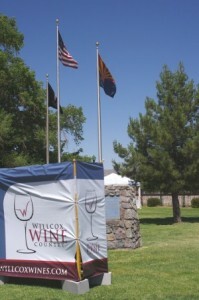 The Ticket booth is located at he main entry to the Willcox Wine Festival. After doing our tastings, we wandered across the street to Rodney’s, our old standby restaurant. Although there was food in the park, we like to visit with Rodney since he makes the best catfish poor boys in Willcox. His gumbo is always good and it can be a tossup for me to choose which I want. This is good Southern Cooking and you can sit in the shade on the back patio to enjoy the food or take it back to the park. Rodney is always there, greets us with a smile and joke. The rail car on the corner of Railroad and Maley Streets is a restaurant for Big Tex BBQ but it is not open on Sundays. If you want to stay around the park, you are limited to food vendors at the festival, Big Tex or Rodney’s. There are other restaurants a short drive away. 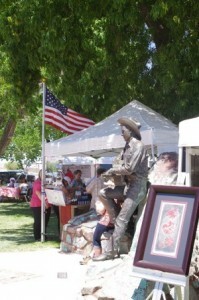 The Willcox Wine Festival booths of Arizona Stronghold, Kief Joshua and Gallifant were represented. 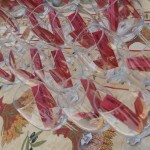 I have done blogs on the wineries in Willcox and Sonoita and you can read these if you wish. 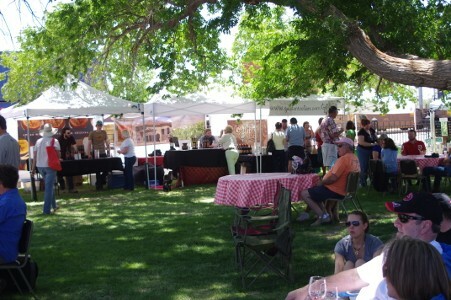 There will be another Willcox Wine Festival in October, on the 19th and 20th. 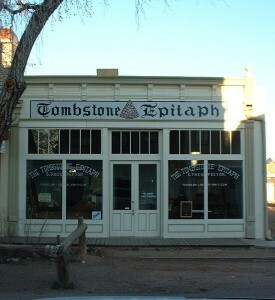 This is the same weekend as Helldorado Days in Tombstone. It is also near the end of the bird migration through the San Pedro River Valley. This will also be the first weekend that Kartchner Caverns will have The Big Room open for tours. So it will be a jam packed weekend of activities in Cochise County and there will many reasons for people to visit. It ought to be a great weekend for you to join in on the fun and then to stay at Down By The River B and B, the Lodging Hub of Cochise County and have one of our outstanding breakfasts. You can take time to visit different events and stay at our centrally located B and B for the night. This lodging throughout Cochise County fills up quickly so make your plans now to make sure you are able to get your reservation before your chances are gone. This entry was posted 6 years ago on Sunday, May 26th, 2013. and is filed under Events and Things To Do, Outdoor Recreation. 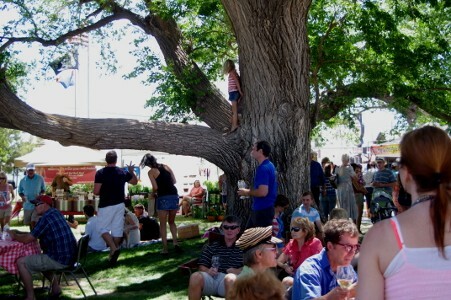 The Willcox Wine Festival has more than wine. 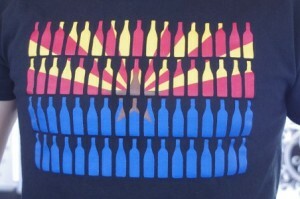 This T shirt is offered by Carlson Creek Winery.